A new charity that pays for and helps organize reunions for combat veterans has received a $50,000 grant, the highest honor in this year’s Newman’s Own Awards competition. “The prevailing narrative about my veteran generation is wrong. We are not broken, we don’t need to be fixed, we don’t need over-engineered solutions. 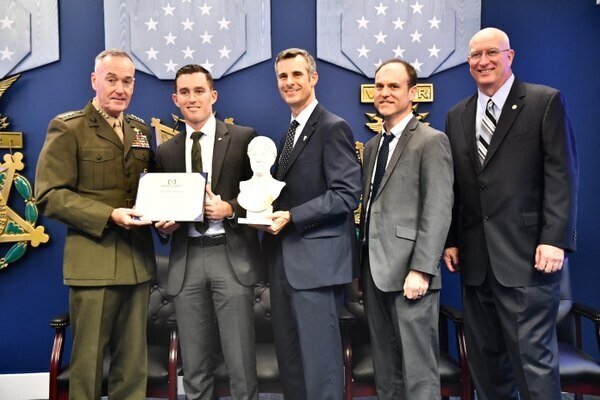 We just need each other,” said Marine Corps veteran James Ferguson, founder of the Warrior Reunion Foundation of Cockeysville, Maryland, in accepting the award at the Pentagon Friday. In just over a year, the foundation has provided seven reunions to soldiers who deployed to combat together. The eighth reunion is scheduled for November. While the reunions so far have involved units in the post-9/11 conflicts, their eligibility spans all generations of veterans — soldiers in any unit who served together in any combat zone during any armed conflict. This marks the 19th year of the awards, sponsored by Newman’s Own, the Fisher House Foundation, and Military Times. Since the program was launched in 1999, Newman’s Own and Fisher House Foundation have contributed $1.9 million to 179 organizations for their innovative programs to improve quality of life in the military community. Five organizations were awarded a combined total of $200,000 in a ceremony Friday at the Pentagon. The organizations’ work “transcends the 50 people, 1,000 people, 100 people” they touch in their work, said Joint Chiefs Chairman Marine Gen. Joseph Dunford. “It’s sending a message that you value our veterans,” he said. And this message has an impact on retention and on recruiting, as veterans in the community encourage younger generations to serve, he said. The ability of the United States to sustain the high quality all-volunteer force “is really about the loud and clear message that we respect, value and appreciate the service of those in uniform,” he said. Newman’s Own, founded by Navy veteran and actor Paul Newman in 1982, has donated more than $530 million to thousands of charities, donating all the profits and royalties from the sale of its food products. “Our giving is at its best when we meet organizations like those here today that address the needs that fall in between the pillars of what’s already in the establishment,” said Jeffrey Smith, vice president of operations for Newman’s Own, Inc. “In many ways, our giving and your doing has the connective tissue” that enables solutions to come together, he said. Andrew Tilghman, executive editor of Military Times, noted that over the years, the Newman’s Own award winners have provided a snapshot in time of what service members and veterans need most — such as groups sending care packages overseas, and providing funding for phone calls, and providing various forms of support for families of deployed service members in the early 2000s. Today, the groups are focusing more on the long-term transition of veterans. While the all-volunteer force has been an historic success, he said, sometimes it’s taken for granted. Ferguson said his organization is helping to support those long-term needs by helping combat comrades easily reconnect, sharing experiences only those in the same unit may understand. They pay for the reunions and help guide unit members through the planning process. The warrior reunions are often held outdoors, in environments more similar to a field environment, with the veterans sleeping in cots under tents. They share stories around bonfires and during activities; they hear from experts from support organizations serving a variety of needs; they do service projects; and they hold memorial services for the fallen in their unit. Often, some of their Gold Star families attend. The reunions are modeled after the first one Ferguson organized for his Marine unit in 2015, which he started because he needed to spend time with his fellow Marines. Judges in the competition are Dunford’s wife Ellyn, Tammy Fisher, Suzie Schwartz and Lynn Pace, all trustees of the Fisher House Foundation, and Smith from Newman’s Own. Code Platoon, Chicago, Illinois. Provides software coding training to help local veterans and military spouses pursue careers as professional software developers. Students can use their GI Bill benefits or apply for scholarships. Classes of eight to 12 students spend 60 to 80 hours a week for 14 weeks. The course is a mix of lectures, advanced coding training in Python and Ruby on Rails and team projects. West Virginia Health Right, Inc., Charleston, West Virginia. Provides free dental care to low income West Virginia veterans without dental coverage, through their Veteran’s Dental Program. The care includes cleanings, exams, fillings, extractions and dentures. This grant will be used to help fund a program that will use a mobile dental clinic traveling to six rural counties and the onsite dental clinic at their main office, treating 500 veterans in need. Healing Warriors Program, Boulder, Colorado. A nonprofit clinic that provides non-narcotic Integrative Care therapies to treat pain and symptoms of post-traumatic stress in veterans, active duty members and their families throughout the Colorado Front Range and southern Wyoming. Their mission is to advance the well-being through these evidence-based Integrative Care services and education. Vets on Track Foundation, Inc., Garrisonville, Virginia. Furnishes homes for veterans who have been placed into permanent housing after living on the streets or in a shelter. This “Fresh Start” program volunteers turn these houses into warm, loving homes with everything from sofas, beds, dining room tables and chairs, dishes and silverware, to pictures, pillows and blankets.